These public sittings into the circumstances of the second GSM licence competition, the award of the licence itself, and certain broadly related matters arise because Paragraph (g) of the Terms of Reference requires the Tribunal to inquire whether Mr. Lowry did any act or made any decision in the course of any ministerial office held by him to confer any benefit on any person making a payment referred to in Paragraph (e) or any person who was the source of any money referred to in Paragraph (f) or any other person in return for such payment being made or procured or directed any other person to do such act or make such decision. The Tribunal will concentrate mainly on Term of Reference (g) in the course of these public sittings but will revisit Terms of Reference (e) and (f), colloquially described as the “money trail”, in the light of evidence already heard at previous public sittings and further information obtained by the Tribunal. The Tribunal has been informed that in the early 1990s, the telecommunications industry was going through a period of massive investment due to technical breakthroughs and liberalisation of the European markets through pressure from the EU Commission. The pressures were particularly acute within the mobile telephony area. A briefing note for the Minister of Transport, Energy and Communications dated 26th June, 1993, and a memorandum of the Department’s Telecommunications Division dated 18th February, 1993, indicate that the government was aware of EU policy requiring the introduction of a competition for the granting of a second GSM licence in Ireland, and that it had already identified the main elements and broad parameters of the required competition. At that time, it was optimistically thought that an announcement would be made within months calling for applications. The Department produced a memorandum dated 20th May, 1993, which contained recommendations in relation to the design of the competition and considers the question of how the matter was to be advertised and the amount of detail that would be put into the quote for tenders. The appendices to these memoranda included at Appendix 1 the elements to be included in the GSM licence, and at Annex 2 a preliminary draft of the notes for the guidance of applicants. Therefore, by mid-1993, the Department had already prepared preliminary drafts of the basic documentation which ultimately formed the basis for the decision of the government for the launching of a second GSM licence competition. Representatives of the Department attended a workshop on development of regulatory policy for mobile and personal communications in Brussels in September 1993. The workshop was recorded by the Commission as a step in the preparation of a Green Paper on mobile communications which was to be published by the Commission within the following twelve months. The workshop had been arranged to give a ‘kick-start’ to the debate on issues that would be addressed in the Green Paper. Included in the workshop were reports by two external consultants, and they were KPMG and Coopers & Lybrand. In the late summer of 1993, Mr. Martin Brennan, on his return from Europe, was asked if he was interested in taking up a post dealing with telecommunications policy in a context that the Department’s resources in that area were being restricted to separate policy development from regulatory aspects. At that time, Mr. Brennan took up his new post. His predecessor in telecoms, Mr. Paddy Ryan, passed him a series of files dealing with work in progress, one of which was, as described to the Tribunal by Mr. Brennan, a very preliminary look at the question of GSM licensing. Mr. Brennan has informed the Tribunal that sometime in the following couple of months, the Minister of the day, Mr. Brian Cowen, asked him as a matter of priority to prepare for the licensing of a GSM operator within three months. Mr. Brennan responded, based on his limited knowledge of what was at issue, that this would not be possible but that he would attempt to complete research and devise an approach to the selection process within three months. Mr. Brennan has informed the Tribunal that this was the starting point. Mr. Brennan incorporated his views in a note for the Minister dated 19th October, 1993. By letter of the 25th October, 1993, the European Commission indicated that in the absence of an explicit undertaking by the Irish authorities to introduce a competition for GSM telephony in the near future and on the basis of a detailed timetable, the Commission would have to consider opening formal proceedings against Ireland. A meeting took place between Mr. Brennan, his Assistant Principal, Mr. Conan McKenna of the Department of Transport, Energy and Communications, and Mr. Charles Smith and Mr. Jimmy McMeel of the Department of Finance, on the 1st November, 1993. A note of that meeting includes a reference to the Department of Transport, Energy and Communications view that an appropriate balance should be drawn between the initial fee and any ongoing take from the licence. The note also states that it was the Department’s intention that the decision would be made by the Minister following the appropriate statutory consultations, but that the question of a submission to Government was being left open for the moment. It was agreed that the Department should keep in touch with a view to developing a common approach in relation to any valuation tender. By letter dated 15th November, 1993, the Assistant Secretary of the Department of Finance wrote to Mr. John Loughrey, Secretary of the Department of Transport, Energy and Communication, suggesting that in view of its significance and in view of recent contacts and a statement by the Minister in the Dail of his intention to soon launch a competition, it would be desirable that the Department of Finance should be closely associated with the project at all stages, including the operation of the tender process, the selection of consultants, and the evaluation of bids, as well as involvement in the elaboration of a suitable fee structure. For this reason, the Department of Finance suggested the creation of a small interdepartmental Project Group. On the 26th November, 1993, Mr. John Loughrey furnished a memorandum to the Taoiseach which gave a broad indication of progress in preparation for a competition launch. Mr. Martin Brennan has informed the Tribunal that while there were other staff in the division, he was assisted in the early research phase in the main by Mr. Conan McKenna, who was then an Assistant Principal working with him. He probably had ongoing informal contact with Mr. Sean McMahon, who was the Principal Officer dealing with telecommunications regulatory affairs in the Department, and who had commenced in that capacity at the same time that Mr. Brennan was assigned to the area. Mr. Conan McKenna was succeeded in September 1994 by Mr. Fintan Towey. Ms. Nuala Free and Ms. Margaret O’Keefe were job-sharing Executive Officers in Mr. Brennan’s division. Mr. McMahon was assisted by a number of people in his own division, and more particularly by Mr. Ed O’Callaghan, the Tribunal has been informed. From an early stage, Mr. Brennan had regular contacts with Mr. Jimmy McMeel, an Assistant Principal Officer in the Department of Finance and Mr. Billy Riordan, an accountant on loan from the private sector to the Department of Finance. Officially, a Mr. Denis O’Connor, also on loan from the private sector, fulfilled a similar role to Mr. Billy Riordan in the Department of Transport, Energy and Communications, but when the project team was up and running, he was replaced by another person on loan from the private sector, Mr. Donal Buggy. In this early research phase, Mr. Brennan had contact with Mr. John McQuaid, head of the technical side of telecommunications area; and he, Mr. McQuaid, was assisted by Mr. Aidan Ryan. All of these individuals, with the exception of Mr. Conan McKenna, participated as members, deputy or fulfilled an executive role in the GSM Project Group. Mr. Martin Brennan ultimately chaired the Project Group. Andersen Management International were eventually appointed as consultants to that group. The interdepartmental Project Group was formed in March 1994. Mr. Brennan has informed the Tribunal that in the period when he was learning and researching the business of a GSM process, he effectively had an open-door policy to interested parties. It gradually became known in the market that he was engaged in this task, and various parties representing potential interested parties came to see him. Mr. Conan McKenna sat in on most, if not all, of these meetings. Examples of the kind of things that Mr. Brennan discussed with visitors were, what would be a reasonable time-frame between announcement and closing date; views on the respective merits of auction versus beauty contest versus hybrid; whether there would be merit in having all applications compulsorily on plain white paper, without names, other than in a covering letter which would not be made available to the selectors; whether it be possible to limit the overall physical size of applications; questions around roll-out time frames and geographical coverage. Mr. Brennan’s primary source of intelligence about how to approach a selected process for a licence for GSM, apart from the files inherited from Mr. Ryan, lay in the report prepared by KPMG for the European Commission, which formed part of the material used in the workshop attended by departmental officials in September 1993. On the 28th March, 1994, permission was sought by the Department of Transport, Energy and Communication from the Department of Finance as a matter of urgency for the sanction of and expenditure of up to £20,000 sterling on consultancy expenses for KPMG Peat Marwick (Mr. Roger Pye, Partner), in order to obtain expert and authoritative international input to the work of the Project Group. This sanction was quickly obtained and the services of KPMG were engaged on the 30th March, 1994. They were furnished with draft documentation for the proposed GSM licence. KPMG commented on this draft documentation in the Report dated 6th April, 1994, and noted that the draft documentation furnished contained, inter alia, a combination of beauty parade and a fee element with unclear weightings, and at Point 3.2, included in the selection criteria in the draft tender document, “financial capacity” of proposed licencee. – Approach to air time resale. The first meeting of the GSM Project Group took place on the 29th April, 1994, and the question of retaining outside consultants and the necessity for Telecom Eireann to deal with all preliminary matters were discussed. By letter dated 4th May, 1994, the European Commission issued a reasoned opinion and gave Ireland two months to act before the Commission initiated proceedings against Ireland. The letter from the European Commission is addressed to Mr. Sean Fitzgerald of the Department of Transport, Energy and Communications. It’s from the Competition Director. I write to you concerning a bilateral meeting held on the 28th June, 1993, with Mr. Ryan and his staff where we discussed two important and urgent issues in the telecommunications area. The first of these concerned the implementation of the 1990 Services Directive in the Republic and in particular the scope of exclusive rights on voice telephony. By letter of the 30 July 1993, I have received a response on this issue. I would like to reserve my position on this reply until I see how matters develop in the market. I now need to follow up the second issue on which I have not received a reply. This concerns the GSM mobile telephony monopoly in the Republic. I should be pleased to know what steps you are taking for the granting of additional GSM licences and what time-frame is envisaged. Recently the Commission initiated infringement proceedings against two Member States which have failed to authorise at least a second GSM operator. The Commission is also in discussion with a third member State which has not opened up GSM mobile telephony to competition. You will understand that in the absence of an explicit undertaking by the Irish authorities to introduce competition for GSM mobile telephony in the near future and on the basis of a detailed timetable, the Commission will have to consider opening formal proceedings against Ireland. I will be very grateful if you would provide the Commission with a reply to my question within a period of four weeks. My services are at your disposal for any help and further information you may require. On the 10th June, 1994, KPMG furnished their comments on the documents redrafted by the Department following on their initial comments, and they do not appear to pass adverse comments on the ranking of the “credibility of business plan and financial viability of applicants” in the selection criteria in the draft tender document. By letter dated 11th June, 1994, Mr. Douglas Goldschmidt, the then Chief Executive of ESAT Telecom, wrote to the Department and furnished some thoughts on how the upcoming GSM licence bid might be evaluated and about the types of fees which might be associated with the GSM licence. Such a communication should not necessarily be viewed as improper, as the Department continued to have an open-door policy. We have pulled together some thoughts on how the upcoming GSM licence bids might be evaluated and about the types of fees which might be associated with the GSM licence. These are merely suggestive, and we hope they are useful. Please call me or Ed Kelly if you should have any questions or would like to discuss them further. By letter dated 1th July, 1994, the Irish permanent representative requested Commissioner Karel van Miert for an extension of one month in the date for which a formal reply to his letter of the 4th May was required. On the 11th July, 1994, Mr. Jimmy McMeel of the Department of Finance wrote to Mr. Brennan and informed him that Finance were anxious that the market should be allowed to fix the amount of the up-front payment and ongoing royalty in the context of the tender process. Mr. Brennan replied to Mr. McMeel by letter dated 12th July, 1994, informing him that there was “no crock of gold” available for the licence and that his best estimate was that £20 million might be the most that could be obtained which, at that level, it could have the effect of significantly higher tariffs and less real competition when fed into the project economics. This view as expressed by Mr. Brennan was not a unique view and was a view which was held by many members of his Department and perhaps represented the view of the department. I think Mr. Brennan’s letter of the 12th July, 1994, is addressed to Mr. McMeel. “Thank you for your letter of the 11th July, 1994, regarding the question of “State take” from the second mobile operator. Firstly, I wish to put the matter in perspective. There is no “crock of gold” available for this licence. Our best estimate, taking all factors into account, including the very high numbers reported in respect of Greece and Italy, is that if an up-front payment was the only ingredient, it would amount to only about £18 million; it could be rounded up to £20 million. (You will no doubt have noted that Telecom Eireann independently used this amount in their model). Bearing in mind that there could be up to six competitions running simultaneously in Europe, these figures may err on the side of optimism. Secondly, we are confident that what we are proposing is eminently defensible and presentable. We have spoken formally to the market quite extensively in recent months, and the feedback is that no matter how we present the options, if we leave two floating cash lines, the up-front amount will dominate. Another important consideration is that your Department’s analysis focuses on the State-take from the second operator in isolation. Naturally one could expect the NPV to come out in the same ballpark for a variety of options in this case and theoretically it should be a matter of indifference to the State in that event. This could be true insofar as cash flow to the State is concerned but taking the wider effects on the project into account it is a doubtful premise. Most importantly in this context, however, is that an approach weighted towards royalty will capture the entire turnover of the mobile telephone business, including Eircell. Bearing in mind that Eircell is a highly profitable business it is of considerable interest to establish a direct State-take from it. An alternative approach which would be saddle Eircell with an equivalent up-front payment to be offered by the market would likely be highly contentious and at the end of the day would be no more than a paper transaction since it would impact directly on the profitability of Telecom Eireann and come out of shareholder value by one means or another. Finally, if our analysis is correct (and we have considerable confidence that it is) then as and if the initial payment goes above £10 million the potential royalty would tend towards derisory levels; the market would recognise this and be even more inclined to plump for the temptation of a high up-front payment perhaps even exclusively. In summary, this Department believes that there is an overwhelming case in favour of the option which we have chosen but would very much like your Department to accept this on the basis of conviction. We see no merit in this aspect being put forward to the Government as an open issue. – Efficiency of proposed use of frequency spectrum resources. “While the level of ongoing payments is one of the criteria it is specifically stated that this is neither the sole nor the most important criterion on which a decision will be made. The annual State-take will be a royalty based on revenue rather than profits. Tenderers will be asked to indicate, for information purposes only, the likely direct and indirect employment consequences of these proposals in Ireland. Consultant will be required to assist with the evaluation. The perception of objectivity in our evaluation and comparison of tenders will be critical”. This of course represented the Department thinking at that time, but it subsequently evolved. Mr. John Loughrey, in a note dated 3rd November, 1994, informed Mr. Sean Fitzgerald, Assistant Secretary, that the question of a second cellular phone licence was discussed at length at the previous night’s Cabinet meeting but that no decision had been taken. It was decided that the aide-memoire should be expanded. Mr. Brian Cowen was the Minister in the Department at this time. In a memorandum of the 6th January, 1995, Mr. Lowry, who had been appointed to that Ministry in December of 1994, was advised that it was not necessary to resubmit the issue of the second GSM licence to the Government unless he wished to do so for political reasons. “1. Re: Submission to Government. “2. Representations made to the Chief Executive of Telecom against applying the same fixed and royalty payments to Eircell as will be paid by the successful bidder. It was our intention to apply the same licence conditions to Eircell (Telecom’s mobile business) in the interests of preserving fair competition. It is not alluded to specifically in the draft tender documentation. Mr. Towey’s note sets out the background to this issue. Around this time, Department of Transport, Energy and Communication documents and Department of Finance documents indicate that information was being obtained about the Commission’s concerns regarding initial payments made by those awarded GSM licences which might be to the detriment of the new operator and which the Commission believed to be discriminatory conditions and incompatible with the rules of Article 90, paragraph 1, and 86 of the EC Treaty. These concerns appear to relate mainly to the cases of Italy and Belgium. It suffices to say at this stage that the initial payments in the cases of those two countries appears to have been very large. On the 25 January, 1995, the Minister for Finance, Mr. Ruari Quinn, wrote to Minister Lowry regarding the budgetary provisions which had been made in connection with Telecom Eireann’s dividend and the second mobile telephony licence. A sum of £25 million had been forecast for dividends from Telecom, and it was suggested that it would be better to leave it to the market to decide the licence fee for GSM, and that £20 million could reasonably be expected. The letter is dated 25th January, 1995. And it’s addressed to Mr. Michael Lowry, TD, Minister for Transport, Energy and Communications re Telecom dividend, second mobile telephony licence. I am writing to you regarding the budgetary provisions which have been made in connection with the above. I have included in my non-tax revenue forecast a figure of £25 million for dividends from Telecom and, despite the case advanced by the Management of the company, I believe that this is a reasonable expectation. Payment could be by way of a final dividend of £15 million for the year 1994/5 and £10 million interim dividend for the year 1995/6. Obviously the level of the dividend for the calendar year as a whole will depend on the financial performance of, and outlook for, the company, and payment will depend on the emerging position on this front. I note, in this regard, that the Chief Executive Officer has submitted a forecast of a £1 million profit for the year, with zero dividend payment, and that he has reiterated this view. I would like to make a number of points on this. Firstly, the Exchequer must continue to service accumulated telephone debt of more than £300 million retained at the establishment of Telecom Eireann. It is legitimate to expect direct return on that investment. The return to date has been extremely low. Secondly, the forecast will have to be looked at in the light of the final picture on turnover and costs. On the basis of the performance to date, the outturn should be better than projected. Thirdly, an increase in depreciation from k170 million last year to k250 million this year seems excessive. A more moderate increase in the depreciation charge this year, with further increase in the following two years, should be sufficient. There is also the question of a fee from the second mobile licence. We agreed at our bilateral Estimate meeting recently to include £5 million as a minimum up-front fee for this. It seems clear from discussions between our Departments that we cannot be certain now of a stream of royalties in the years ahead, so the sensible thing to do would be to leave it to the market to bid on a basis which would allow a much larger up-front payment to be made. I understand, on the basis of what has happened elsewhere, that a payment in excess of £20 million pounds could reasonably be expected. I will be glad to hear quickly what you think of this so that I can settle this part of my budget. Minister Lowry responded to Minister Quinn on the 26 January, 1995. “Thank you for your recent letter following on our discussion about the Estimates. I want to respond now about the GSM licence. “I am convinced that the overall national strategy for telecommunications should seek to enhance our competitiveness and promote economic growth through the provision of high-quality services at sharply competitive prices. Mobile is a sector where we can follow this strategy at an early date without having to wait for improved competitiveness in Telecom Eireann and without damaging the company; for the time being, it is a relatively stand-alone segment of the communications with very significant growth potential. Telecom Eireann accepts this view and are planning for vigorous growth of the Eircell operation themselves. An expanding mobile sector also increases the volume of telephone traffic through the fixed network with consequent benefits to Telecom Eireann. The analysis we have undertaken shows that if we are to charge or expect a licence fee commensurate with certain other countries then prices would settle out at a level of about 20% higher than would be the case without such a fee; it is assumed that whether a fee up front or an equivalent royalty has a neutral effect but increases the capital investment on which an operator will seek an acceptable return. Furthermore, we are now aware that the Commission of the European Union has started to investigate with the Member States concerned the competition aspects of the licence fees for the second GSM operator. Our information is that the Commission is pursuing both cases where fees were charged equally on new and incumbent operators and where only the new operator was charged, citing slightly different arguments in both cases. Telecom Eireann also made strong representations, which were reasonably well grounded, to the effect that a royalty which was effectively determined by a competitor and could be set at a level taking account of the longer-term ambitions in the Irish market could damage the mobile business of Eircell – the Telecom Eireann mobile operation. Finally, mobile telephony is, and is likely to continue to be, a profitable business yielding other benefits to the State. In all these circumstances, I am strongly of the view that an access fee set at a level that will more than cover our costs and at the same time should escape scrutiny by the Commission is the appropriate course and that £5m is the appropriate level. I am providing separately for the payment of significant frequency spectrum fees and the introduction of a regime whereby the telecommunications sector will defray the cost of regulating and administering itself without any resort to the Exchequer in an annual licence fee to be applied eventually to all operators. I hope you will be in a position quickly to agree to this, because at this stage delay in launching the competition is a problem in itself. At the end of January 1995, a draft speaking note of Minister Lowry for Cabinet was prepared registering his unhappiness regarding the position of the Department of Finance on Telecom’s proposed dividends and the GSM licence fee. In an aide-memoire for the Government meeting on the 31 January, 1995, the Minister informed the Government of his intention to announce a competition for the award of a single licence in competition with Telecom Eireann. He also informed the Government that having regard to the risk of legal action from the Commission concerning large up-front fees for GSM licensees, and the argument of Telecom Eireann concerning the imposition of royalties on the incumbent operator, that he had decided to limit an entry fee of £5 million for the new entrant and drop the annual royalty requirements and award the licence to the bidder presenting the most attractive approach to market development, a commitment to a high-quality nationwide service, and an innovative approach to tariffs and a low price. By letter dated 6th February, 1995, the Department of Finance wrote to the Secretary of the Department of Transport, Energy and Communications noting that the Minister for Transport, Energy and Communications had decided to have the GSM licence fee determined by the market, and indicated that the Minister for Finance did not agree that no provision for Telecom’s dividend should be made in the 1995 budget. A further lengthy aide-memoire was prepared for the Government meeting on the 7th February, 1995. The aid-memoire noted that the Minister for Transport, Energy and Communications and the Minister for Finance had agreed that there should be provision for the market to determine the appropriate up-front fee payable in the course of tender process. The aide-memoire also informed the Government of the selection process. – The proposed fees for the licence. The highest bidder will not necessarily be successful, and this is clearly stated and emphasised in the tender documentation. The documentation indicates that the Minister intends to compare the applications on an equitable basis, subject to being satisfied as to the financial and technical capability of the applicant, in accordance with the information required therein and specifically with regard to the list of evaluation criteria set out below in descending order of priority. “Tenderers will be requested to specify the approach which will be adopted to the disposition of windfall gains following the award of the licence. Such gains could materialise as a result of significant reduction in interconnection charges or possibly through a legal requirement to return the licence fee. The objective will be to ensure that the benefits are passed on to the consumer. Tenderers will also be asked to indicate, for information purposes only, the likely direct and indirect employment consequences of their proposals in Ireland. Consultants will be required to assist with the evaluation. The perception of objectivity in our evaluation and comparison of tenders will be critical”. At this time, it appears that the question of a financial capacity and technical capacity have been taken out of scoring criteria in the evaluation process and have been elevated to the position of requiring the consideration of the Minister and the Minister to be satisfied of those two elements before recommending who the successful applicant should be, that applicant having been assessed in descending order of the criteria contained in the bullet points in the aide-memoire to Government. The Government decided on the 7th February, 1995, that a Cabinet Sub-Committee consisting of the Taoiseach in the chair, the Tanaiste and Minister for Finance, Social Welfare, Transport, Energy and Communication, and Enterprise and Employment should review the proposed financial terms, tendering procedure and proposed advertisements for the GSM licence. The Cabinet Sub-Committee met on the 16th February, 1995, and agreed to proceed with the proposed GSM tender competition as outlined in the Minister for Transport, Energy and Communications’ aide-memoire for the Cabinet committee, which did not differ materially from the aide-memoire which had been presented to the previous meeting of the Government. “The Minister for Transport, Energy and Communications seeks the approval of the Government that an open competitive and bidding process be announced with a view to the granting of licence to a second cellular phone operator. The bidding process will be promoted and controlled by the Department of Transport, Energy and Communications, and it is expected that a recommendation will be put by the Minister to Government in time for a final decision by the 31 October, 1995. “The general terms and conditions attaching to this licence are set out in the attached appendix. – Then a decision was sought in relation to proposals for independent regulation of the telecommunications sector. The conveying of this decision of the Government made reference to the memorandum which had been submitted to Government dated 17 February, 1995. On the 2 March, 1995, there was the formal announcement of the competition by the Minister, and the request for tender documents and a memorandum for the guidance of licence applicants was made available on payment of a non-refundable fee of £5,000. The formal announcement stated that only organisations which purchased the documentation may participate in the competition. This history of the evolution of policy which resulted from the decision of the Government of 2 March, 1995, appears to show that, in the course of debate between the Department of Transport, Energy and Communications and the Department of Finance, the policy with regard to a licence fee developed from one where it was proposed to charge an initial fee of £3 million, coupled with an ongoing royalty payment to one where it was proposed to charge an initial fee of £5 million with no ongoing royalty payments, and to one where provision for the market to determine the appropriate up-front fee payable in the case of the tender process subject to a minimum fee of £5 million. This minimum initial fee appears to be equivalent to the proposed administrative cost of the competition. This history also shows that the question of financial capacity or financial viability of applicants and technical experience and capability of applicants was removed from the criteria which was to be used in the evaluation of tenders and would appear to have been given greater prominence in that the Minister had to be satisfied as to the financial and technical capability of the applicant in comparing the applications on an equitable basis in accordance with the information required in the RFP, and specifically with regard to the list of evaluation criteria. When I have used the expression “RFP”, that is the tender document. This in fact has the technical expression of RFP, which is a Request For Proposals. This is the document which was issued on payment of £5,000 by anyone who wished to consider whether they proposed entering the competition for the second GSM licence. This document is a document issued by the Department of Transport, Energy and Communications, and it’s headed “Competition for a licence to provide digital mobile cellular communications GSM in Ireland”. Paragraph 1: “The Minister for Transport, Energy and Communications of Ireland invites applications for a single licence to provide and operate within Ireland a public pan-European cellular digital land-based mobile communication system as described in the Annex to Council Recommendation 87/371/EEC of 25th June 1987 (O.J. No. L196, 17.7 1987 p81) in competition with the equivalent offering by Telecom Eireann. Paragraph 2 set out the section of the statute under which the licence would be issued, and that it would be valid for a period of 15 years. Before I deal specifically with provisions in this document, I should perhaps indicate that the document contained provisions which provided that the selection process would be terminated by the 31 October 1995; that there would be an opportunity given for applicants to pose questions in writing; that short presentation would be made by applicants, and that consultants would assist in the process. Paragraph 4 provided that “The minimum initial fee for the licence will be £5 million, and applicants are free to offer a higher amount to win the right to the licence”. Then it set out various minimum standards. Paragraph 19 states: “The Minister intends to compare the applications on an equitable basis, subject to being satisfied as to the financial and technical capability of the applicant, in accordance with information required herein and specifically with regard to the list of evaluation criteria set out below in descending order of priority. – Efficiency of proposed use of frequency spectrum resources”. Paragraph 19 of this document was a clear reflection of Government policy and was the basis whereby the Minister could bring the matter to Government in accordance with Government policy with a recommendation for a decision to be made by Government not later than the 31 October, 1995. Now, that time-frame changed later, but that was the only change in respect of Government policy other than, of course, to deal with the question of an alteration of the document concerning the fee applicable for the licence. Mr. Martin Brennan, in response to queries concerning the construction of this particular paragraph, has informed the Tribunal that the RFP document was an attempt to gather together all the things that should be included in a competition process. Having regard to paragraph 19, he thinks it is clear that the perambulator part is a prerequisite to admission to the competition assessment. He has also informed the Tribunal that at some stage in their preparatory work, they considered the possibility of a two stage process, with the first being a prequalification stage. This was certainly mentioned to or by KPMG when they were assisting the Department. Mr. Brennan’s feeling, rather than his recollection, is that elevating the financial and technical capability issue to what he has described as “the chapeau”, was a pragmatic response to this issue. Other than that, he cannot attach any particular significance to the matter. Mr. Fintan Towey, in response to queries from the Tribunal as to the construction of this particular paragraph, has informed the Tribunal that he believed and was always of the view that the requirements expressed in, again, what Mr. Towey describes as “the chapeau”, would potentially have been used to disqualify candidates in advance of a full evaluation in accordance with the detailed criteria. He did not consider it possible that any applicant that was deficient in these respects could score well in the more detailed evaluation, given the importance attached to financial and technical capability in the evaluation. Had the number of applicants been significantly greater, the chapeau requirements may have been used on a preliminary basis to narrow the field. In any event, Mr. Towey has informed the Tribunal, this did not arise. “Update: MB indicated any significant changes on the GSM issue since the last meeting, i.e. – A change on emphasis from royalties to an up-front payment but considerable emphasis on deal to a consumer. – A clause to ensure that the consumer benefits from any windfall profits. – A clause signifying a funding mechanism may be set up for the Regulator when established. – Interconnect Prices are included in the documentation included in the listing for N. Ireland; all international calls to be routed through TE’s switched network. – Advance warning for a possible Universal Service Fund. There was a discussion in relation to the spectrum, and then a discussion on the critical path. A document detailing critical path was circulated. It was agreed that the consultants would be required to advise on a successful applicant by approximately mid-September in order to give ample time to put the matter to Government for decision. Tender document commits to announcement of successful applicant by 31 October 1995. Crucial from a credibility point of view to maintain political commitment and to comply to this deadline. Then Clause 4 deals with the consultants, and Martin Brennan gave a run-down and indicated that ongoing liaison with consultants was agreed in principle, with consultants themselves to propose a mechanism for this. Then there was a discussion on information rounds. 6: Procedures for dealing with potential bidders during the tender process was agreed. – A record to be kept of any meetings/conversations between D/TEC people and any of the bidders. D/TEC should stress at any such meeting that it is an informal exploratory contact. Then there was a discussion of items which needed to be examined in the context of the GSM II, and I don’t think we need, at this stage, perhaps, to deal with them. Mr. John McQuaid, who headed up the technical side of the division, and it was copied to the staff in the developmental side of the division; that is, Mr. Martin Brennan’s side of the division. Mr. Martin Brennan’s note reads: “We had a meeting of the GSM project this morning for a preliminary run over the course. Always at least two people present on our side. Always stress that discussion is by way of informal clarification subject to formalisation in the written information round provided for in the competition. Always produce a brief record of attendance and discussion. CHAIRMAN: Well, I think, Mr. Coughlan, you are moving to an aspect of one of Mr. John Loughrey’s communications or statements to the Tribunal of some relative length, so it’s probably an appropriate moment to pause for lunch. We will resume at five to two. Thank you. MR. COUGHLAN: Before lunch, Sir, I had referred to the procedures which had been adopted by the GSM Project Group dealing with the tender process, particularly in relation to confidentiality, and had indicated that Mr. Brennan had sent a note about this to, among others, the Secretary of the Department, Mr. John Loughrey. Mr. John Loughrey has informed the Tribunal that he believes the Project Group chaired by Martin Brennan was both prudent and astute to agree on procedures for dealing with potential bidders during the time before the closed period of the competition. He was informed of these procedures and approved of them. While by definition civil servants operate under the State Secrets Act and would not knowingly confer an advantage on any potential participant in any bidding process, the protocol was nonetheless valuable in that it brought to the front of the agenda the necessity not only to ensure that it didn’t happen, but perhaps more importantly that there would be no perception of advantage being conferred on any potential participant. Mr. Loughrey has informed the Tribunal that not only did he discuss this protocol with the Minister but on several occasions advised the Minister about contacts with members of declared consortia or indeed other potential participants in the competition. Clearly the Minister would have to exercise discretion, as, for example, ESB was a participant in one of the consortia. The Minister readily accepted at all times Mr. Loughrey’s advice in these matters, and while the Minister met some participants on issues outside the closed period of the GSM competition or if the competition were to arise during the meeting on another issue, the Minister handled it no more than on a courtesy basis and did not, to Mr. Loughrey’s knowledge, ever discuss content, which would be perceived to be an advantage to any such participant. Mr. Loughrey has informed the Tribunal that naturally, the Minister accepted and fully respected the position that there could be no discussion on the competition with anyone who was a participant in the competition and notably during the closed period between the bid entry and result. In any event, Mr. Loughrey has informed the Tribunal that the Minister, along with himself or any other person outside the Project Group, was not in a position to impart any information of significance. On the 7 March 1995, the Minister made a Dail statement regarding the competition. On the 9 March 1995, there was a Fine Gael fundraising event for the Carlow Kilkenny constituency, and it was held at New Park Hotel, Kilkenny. The Fine Gael records show that there was a subscription of £1,000 for a table paid by ESAT Telecom/Denis O’Brien. An entry for this fundraiser appears in the diary for Michael Lowry, but the Tribunal is not aware whether Mr. Lowry attended the event. On the 10 March 1995, there was a fundraising lunch for the constituency of the late Mr. Jim Mitchell in Dublin central. Fine Gael records show that there was a subscription of £2,000 from ESAT Telecom/Denis O’Brien. An entry for this fundraising lunch appears in the diary of Mr. Michael Lowry, but the Tribunal is not yet aware whether Mr. Lowry attended the event. “Denis, I understand our group will be meeting in Dublin next Tuesday, 21 March 1994. The sole purpose of the meeting is the Shareholders’ Agreement. I know you share my hope that our respective attorneys will have made good progress before next Tuesday. “I did, however, want to raise a major point related to the cellular bid. While we were led to believe the licence fee would be fixed and that interconnect rates would be reasonable, the RFP now makes us realise the situation is very different. If we look at what has happened in an auction environment elsewhere in Europe, it’s fairly safe to assume that the licence fee could very well exceed an amount equal to eight, nine, or even ten times as much as originally envisioned. Obviously we are working diligently on the financials, but I think it very safe to assume our view of the equity requirement is no longer applicable. We envision scenarios where it could easily double. “I hope progress is made on the fundamental issues on the Shareholders’ Agreement. There are so many critical and very difficult decisions to be made, and the clock is ticking. I should perhaps explain at this stage that at this time, Mr. O’Brien’s company, ESAT Telecom, were involved in discussions or negotiations with Southwestern Bell and Detacon in relation to putting together a consortium to bid for the second GSM mobile licence. This letter had followed on a previous letter from ESAT Telecom from Mr. O’Brien to Mr. Moran of Southwestern Bell Development, Mr. Venski of Detacon and Mr. Terrence Halpin of Southwestern Bell International Development, dated 27 January, 1995. “Dear Heiner Denis and Terry. “In our meeting on the 20 January 1995, SBID and Detacon asked ESAT Telecom to provide a written confirmation from IBI that they are comfortable they can raise the financing to fund Esat Telecom’s anticipated equity investment in Esat Cellular. The request was made by Mr. Liam Coonan of Southwestern Bell International. We pointed out to you in that meeting that Esat Telecom has already responded to questions from Southwestern Bell and Detacon regarding Esat Telecom’s ability to fund the capital to be subscribed by Esat Telecom in Esat Cellular. Since our meeting on the 20 January, we have gone back to review our discussions with you on this topic and verified that in November 1994, Investment Bank of Ireland confirmed to you in a meeting at IBI that it was comfortable that it could raise the equity to be contributed by Esat Telecom in Esat Cellular. Accordingly, you already have an assurance from IBI, and nothing further should be required in that regard. “We have also informed you that Advent International, a minority investor in Communicorp Group Limited, the parent company of Esat Telecom and one of the world’s largest venture capital investors, with $1.4 billion under management, has made certain commitments to provide funds to Communicorp Group in respect of the GSM project and has indicated an interest in providing additional funds for this project. In view of the above, Advent International would be providing Esat Telecom with a letter next week regarding its interest and confidence in providing the funds necessary for Esat Telecom’s contribution to the GSM project. We will provide you a copy of that letter. “As you know, Esat Telecom has no obligation to provide you with the assurances requested; however, we are anxious to lay to rest any residual doubts, however irrational, which you have concerning our ability to fund this venture. On receipt of the Advent International letter, you will have received two independent and separate assurances, and this issue will presumably have been closed. “If you have any further questions regarding this matter, please feel free to contact us. The third meeting of the GSM Project Group took place on the 29 March, 1995, and it was decided to pursue Andersen Management International as consultants. There was discussion about the information round and the importance of having the consultant present at the next meeting to assist in drafting detailed replies. The minute of the meeting, the third meeting of the GSM group, on the 29 March, records as being present Mr. Martin Brennan in the chair, Mr. Fintan Towey, Ms. Maev Nic Lochlainn, Mr. Sean McMahon, Mr. Denis O’Connor, Mr. Jimmy McMeel, Mr. Billy O’Riordan, Mr. John McQuaid, Mr. Aidan Ryan. Under the heading “Consultant” it states: “Mr. Martin Brennan give an update of the selection of consultant. The choice was clearly between Andersen, a Danish consultant, and KPMG, but KPMG was too expensive. Andersen was to be pursued on the timetable of the project, legal expertise on the team and to give commitment that the fees would not increase over the bid amount. Some difficulties were arising in relation to sanction from Department of Finance. “Information Round – the following points are emphasised. The particular importance of confidentiality in this industry; The need to comply with the deadlines in the competition documentation; The need to start immediately on draft replies to the information round questions; The recognition that the definition of the role of the regulator was a key and a sensitive issue; The need to identify questions which are for Telecom Eireann, and to request permission from applicants to allow Telecom Eireann, not DTEC, to answer these; and, the importance of having the consultant present at the next meeting to assist in drafting detailed replies. “Mr. Towey circulated a first-cut document categorising all the questions under headings. “Infrastructure – Mr. John McQuaid gave a brief presentation on a draft model detailing the costs of the varying types of infrastructure available. This was a first-draft stage representing an initial step in the process of charging for spectrum. Mr. Brennan highlighted the need to examine experience in other countries. “Firstly, the final decision on this matter is for Ministers, as per Section 111 of the Postal and Telecommunications Services Act 1983. In fact, in its decision of the 2nd March, 1995, to proceed with the competition, the Government made it clear that your Minister was to bring a recommendation to Government before a final decision on the grant of a licence. There is a danger that explicit attachment to a weighting formula could lessen the Government’s legitimate freedom of action in relation to this matter and turn it instead into a mere rubberstamping exercise. If, as a result of the weighting formula, the Government decided differently from the recommendation arrived at using the formula, the entire process could be vulnerable to challenge from disappointed applicants. “Secondly, the Government’s decision also made it clear that the general terms and conditions attaching to the licence would be as set out in the appendix to the Aide-Memoire. The Aide-Memoire circulated for the Cabinet committee meeting of the 16 February outlined the selection process, including the evaluation criteria, but made no reference to a weighting formula. Had it done so, the Minister for Finance would have commented. The logical outcome to a fundamental change to the selection process would be to have the entire matter revert back to Ministers for policy direction. This would delay the overall process and may also serve to break the consensus on other aspects of the matter. A Mr. Tony Boyle, who was Chairman of Persona Digital Telephony Limited, one of the consortia that submitted a bid for the second GSM mobile licences, has informed the Tribunal that he attended the Grand National race meeting at Aintree Racetrack in Liverpool on the 8 April, 1995, with a Mr. Michael McGinley and his father, Mr. James Boyle, deceased. 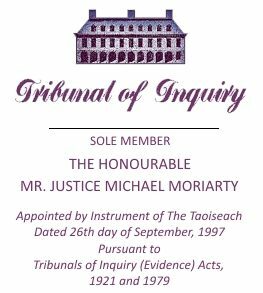 Mr. Boyle has informed the Tribunal that they were guests in the box of a Mr. J. P. McManus at the invitation of Mr. Colm Moloney, insurance broker to their firm. He has informed the Tribunal that in the course of the event, he was introduced to Mr. Dermot Desmond, who was familiar with their business through his business partner, Mr. Michael McGinley. The topic of the second GSM mobile licence competition came up, and Mr. Boyle explained that he had a consortium together to bid for the licence. According to Mr. Boyle, Mr. Dermot Desmond mentioned that he had been approached by Mr. Denis O’Brien of ESAT to act as Chairman of his consortium, but said that he declined as he had had enough of telecoms. Mr. Desmond, according to Mr. Boyle, asked what the process involved and who the decision-maker was. Mr. Boyle has informed the Tribunal that he explained that this would be a public competition run by the Department of Communications and that the decision would be made by them and their Minister, Mr. Michael Lowry. According to Mr. Boyle, Mr. Desmond then responded by saying that he knew exactly who Mr. O’Brien would use to get to Mr. Lowry. No further conversation of significance took place, according to Mr. Boyle. Mr. Dermot Desmond was notified of the information furnished to the Tribunal by Mr. Tony Boyle. Mr. Dermot Desmond has informed the Tribunal that he can confirm that he attended the Aintree race meeting in April 1995 and that he was a guest to Mr. J. P. McManus’s box. He was acquainted with Mr. Tony Boyle and had met him on a number of occasions. Mr. Desmond has informed the Tribunal that he has absolutely no recollection of Mr. Boyle being present in Mr. J. P. McManus’s box at Aintree or being at the races in April 1995, and that even if he was, Mr. Desmond is absolutely satisfied that he did not speak with him. Mr. Desmond has informed the Tribunal that certainly the conversation Mr. Boyle now alleges took place did not take place either at Aintree or at any time before or since that day. Mr. Desmond is absolutely satisfied that he never at any time told Mr. Boyle that he had ever been asked by Mr. Denis O’Brien to be chairman or president of a consortium which Mr. O’Brien intended to establish to bid for the second mobile licence. Mr. Desmond has informed the Tribunal that he was never asked by Mr. O’Brien to become chairman or president of any such consortium. Mr. Desmond has informed the Tribunal that he never asked Mr. Boyle what the process involved or told him that he knew exactly who Mr. O’Brien would use to get to Mr. Lowry. Mr. Desmond has informed the Tribunal that for the avoidance of doubt, he never suggested to anyone that Mr. O’Brien was in a position, either directly or indirectly, to exert influence over Mr. Michael Lowry or anyone else in connection with the granting of the second mobile licence. Mr. Desmond has expressed surprise that Mr. Boyle would state that he was asking about a process when, according to Mr. Boyle, he was being approached to chair a rival consortium. Mr. Desmond has informed the Tribunal that he finds it even more surprising at this stage Mr. Boyle would contend such a conversation took place, especially as no such suggestion had heretofore been made. Mr. Kyran McLaughlin of J & E Davy Stockbrokers has informed the Tribunal that Mr. John Callaghan and Mr. Denis O’Brien came to a meeting in Mr. McLaughlin’s office in April 1995. They inquired as to whether J & E Davy could provide some institutional investment interest to support the Esat Digifone consortium’s application for the second GSM licence. Mr. McLoughlin has informed the Tribunal that he indicated that it would be difficult to generate support from institutional investors as the eventual financial terms of the licence were unknown, and it would be difficult to put a precise financial proposal to potential investors. Mr. McLaughlin has informed the Tribunal that Mr. Tom Byrne of J & E Davy and Mr. Paul Connolly, adviser to the Esat Digifone consortium, jointly prepared a memorandum for prospective investors setting out the principal features of Esat Digifone’s consortium bid. As a result of this, J & E Davy secured three prospective institutional investors who were prepared to provide a conditional commitment to invest £8.5 million Irish. The commitments were conditional upon the Esat Digifone consortium acquiring a licence on financial terms acceptable to the institutions. These commitments were provided in June of 1995. “Update on Consultant” “D Finance has given go-ahead on Andersen as our selected consultant. Press release is expected 11/4/1995 to announce the successful candidate. First all-day meeting with Mr. Michael Andersen will be on Wednesday 19 April. Deadlines will be complied with, especially end of April deadline for information memo. If problems arise, a second memo will be issued. Andersen has also committed to the 8th September 1995 deadline for presentation of advice to DTEC. Arrangements to be finalised to smooth the relationship between the Attorney General’s office and the consultant to cooperate on the production of the draft licence. DTEC need to sign contract and Confidentiality Clause with Andersen. “Some argued in favour of weighting criteria because of the need to provide clarity for GSM applicants. Others believed that too defined a system would leave the Government only with a rubberstamping role in the selection process. No conclusion was drawn. It was agreed to re-open the debate with Andersens. The information round. These were discussed one by one giving initial reactions and clarifying where appropriate. Infrastructural liberalisation was mentioned, administrative charges, DCS 1800, infrastructural costing, numbering roaming, and it was agreed that the next meeting to be held on Wednesday 19 April commencing at 10am. On the 11 April 1995 the Minister for Transport, Energy and Communication, Mr. Michael Lowry, TD, announced that he had appointed Andersens Management International of Copenhagen to assist his Department with the competition which he had announced some weeks ago to select a licencee to become the second GSM mobile telephony operator. “the issue was discussed at length again. It was pointed out that: The process would be open to legal challenge by the Commission if some sort of quantitative evaluation was not performed; The Andersen approach favoured combining quantitative and qualitative elements for evaluation; Giving no guidance as to weighting might lead to the worst case scenario of receiving non-comparable bids. Mr. McMeel of D Finance pointed out that a weighting scheme had not been approved by Government and that such a scheme could result in removing the decision-making role from Cabinet, a role which the Government had expressly reserved to itself. Under the heading “Competition Process”, it was agreed to invite applicants after the 23rd June 1995 to give an oral presentation of the application material. This appears to be a reference to paragraph 19 of the RFP document. A note for the file of the Department of Finance regarding the meeting of the Project Group on the 19th April 1995, under the heading “Application of a weighting formula to the selection criteria”, states: “The selected consultants, Andersen Management International of Denmark, who were present at the meeting, advised that in their experience, not all countries had revealed criteria weightings to applicants for new mobile telephony franchises. It will be important that any weighting formula drawn up can be defended before the European Commission. The extremes are described as a beauty contest versus an auction. On one side all the emphasis on the quality of the service delivered versus emphasis on a fee. Applicants have mentioned the weighting formula in their questions which have to be responded to by the 28 April and also directly by the Minister for Transport, Energy and Communications. At this stage the response will go no further than that contained in the RFP document at paragraph 19 – that is to say, the selection criteria, but with no weightings. No commitment will be given that weightings will be released. DTEC are anxious to state that the question of weightings will be discussed with the consultants with a view to determining a way forward. “D Finance representatives asked whether the entire question of weightings could be deferred until after the applications had been received. D/TEC could not agree with this approach. From inquiry carried out by the Tribunal, it does not appear that there was ever any further elaboration in guidelines for submission of applications in relation to financial capability. “Thank you for your letter of the 8th March 1995. I am very pleased to hear that you have now completed all the preparatory work for the opening up of the GSM market to competition, and I appreciate in particular the possibility set out in the clause 15 for the future second mobile operator to use other infrastructure than that of the current monopoly provider. However, at this stage of the analysis, I cannot exclude that some of the other conditions provided for within the framework of opening up the Irish market could appear to be discriminatory. “The main issue is the amount the applicant is invited to pay for the right to the licence under clause 19. As you are probably aware, the Commission opened in December 1994 an infringement procedure against Italy, which had also included such an auction element as a selection criteria for the second GSM licence. The Commission is of the opinion that such an auction resulting in a fee which is only imposed on the second operator can significantly distort competition and favours the extension of the current dominant position of the incumbent telecommunications organisation. “With regard to this, it is not entirely clear to me from the competition documentation whether Telecom Eireann, which currently offers its own GSM service, would also have to pay the same amount as the new competitor. “In any event, such an initial payment would lead to higher tariffs to recoup the money paid, thus rendering the mobile service less affordable and restricting consumer access to the market, contrary to the objective behind Council Recommendation 87/371/EEC of swift GSM roll-out throughout the community. “Moreover, this documentation does not appear fully transparent. Potential applicants are not aware of the weighting given to the different assessment criteria listed in clause 19. “I was somewhat surprised to note here that the amount the applicant is prepared to pay will have more importance than the qualitative criteria relating to coverage performance and efficiency of the service, which would appear to me difficult to reconcile with the coverage aim set out in Clause 7 and more general objective of ensuring universal service in Ireland. “Finally, I will be glad to receive confirmation that clause 12 does not make any distinction between direct interconnection mobile telephony service within and outside Ireland. “I would of course be happy to discuss these issues with you. My services are also ready to take part in a technical meeting with a view to exchange information and complete their assessment of the situation. “I look forward to your reply in due course. This is the first record which the Tribunal has seen of European intervention in the second GSM licensing process. “D/F representatives emphasised that the Exchequer had budgetary expectations of around £30 million from the second mobile telephony licence fee in 1995. That £30 million was half-way between the equivalent fees achieved in Italy (£20 million) and Spain (£40 million) translated allowing for Irish conditions, i.e. population, GNP. Because of the level of the fees achieved in other countries, there would be public criticism in Ireland if only a token fee was achieved. “It appeared to Department of Finance that DTEC policy was only focused on the reduction of tariffs, which means that the fee would be commensurately small. DTEC started out with a position of 5 million fee only. The successful bidder would have considerable freedom to construct infrastructure which would place them at an advantage for the post-liberalisation telecoms environment in Ireland. This increases the attractiveness of the franchise and ought to be reflected in the level of fee. In response to DTEC’s assertion that the whole process would be turned into an “auction”, the Department of Finance representatives emphasised that they were not totally driven by the fee question. For example, if a bidder offered a large fee with a wholly implausible business or technical plan, it would not win the franchise. (We are sensitive to the interest of the European Commission in the process and the need to avoid accusations of holding an auction.) Department of Finance urged DTEC to respond to the letter that had been issued to them dealing with this issue. The consultants are also to examine the possible methodologies which would arrive at a fee level corresponding to the 1995 budgetary arithmetic. “I refer to your letter of the 31 March 1995 and subsequent discussion within the GSM Project Group of the question of weighting the criteria for selection of the successful GSM applicant. – That the budgetary requirements of the Minister for Finance in relation to the licence fee might not be fully reflected in a weighting mechanism. “The primacy of Government in making the final decision on the second GSM operator is fully recognised. However, as mentioned in your letter of 31st March, the Minister is obliged on foot of the Government decision of the 2nd March 1995 to make a recommendation regarding the award of the licence. The proposed weighting of selection criteria is simply a tool to ensure that this recommendation is made on a fair, objective, and transparent basis. The only alternative is to make a recommendation based on intuitive analysis of the relative merits of the applications based on marks under each heading of the selection criteria. Such a process would, however, in my view, introduce an element of subjectivity, which does not meet the emerging EU requirements of objectivity and transparency and non-discrimination. “It amounts in any event to an implicit weighting mechanism but also opens up the possibility of factors which are not included in the selection criteria at all being brought to bear on the final selection. “The ultimate recommendation to Government will be supported by details of the weighting formula and the arguments in favour of the chosen formula. It will also include a short assessment of the conclusions reached on each of the applications for the GSM licence. I am satisfied that this approach fully accords with the normal practice in submitting recommendations to Government and does not exceptionally limit the Government’s discretion. “In these circumstances, I regret that I cannot accept your contention that the use of a weighting mechanism is a fundamental change to the selection process approved by Government. It is, rather, a logical extension of it, and this is clearly borne out by the approach to evaluation taken by the consultants who tendered for the evaluation job. “The weighting approach is also, as you are aware, strongly favoured by the chosen consultants, Andersen Management International, in order to carry out the first stage of the evaluation, namely the quantitative method. However, given that Andersens proposes to carry out a qualitative analysis and supplementary analysis in particularly difficult areas, I am confident that this allows flexibility to ensure that a perverse result does not emerge. This matter will be discussed further at the GSM Project Group meeting on the 18 May 1995 on the basis of a presentation by Andersen Management International. “Your second concern in relation to a weighting mechanism relates to the importance of the licence fee. You are reminded that the order of priority of the selection criteria has been settled by the Government, and the fee is fourth in the order of priority. This was agreed by your Department in advance of the Government decision. It was also made clear throughout the process that the selection of the second GSM operator would not be simply an auction, but that the introduction of effective competition to the sector and the provision of a good deal for the consumer would be high priorities. This has been made clear to the market in the Minister’s public statements in relation to the competition. It would not, in my view, be acceptable to move the goal posts now, when the game is on, without clarifying the position to potential applicants. Then the letter sets out paragraph 19 of the RFP document. On the 4 May, 1995, Mr. Denis O’Brien sent a memorandum to a Mr. Mike Kedar, John Callaghan, and Massimo Prelz. These three individuals were directors of, or associated with, Mr. O’Brien’s own company, Communicorp Group Limited. Mr. Massimo Prelz was also a director of Advent International and represented their interest on the Communicorp Group board. “Per Simonsen spoke to me today and made the following points.” Mr. Per Simonsen was an executive of Telenor and has already given evidence to the Tribunal. – Following their meeting here in Dublin last week, they briefed their CEO, and his reaction was very positive to their involvement in our GSM bid. – They require board approval, and this should be forthcoming in the week commencing 15th May. – In order to finalise a board paper, they intend to do a financial due diligence on our GSM business plan on Thursday and Friday of this week. – In the meantime they are going to provide some resources, particularly in the technical area, in order to write the bid document. – On Monday next they will send in their technical planner to define how many people require to write the technical part of the bid. They will then be put in place by the middle of next week. – I am due to visit Norway next week to visit their senior management. It would appear from this memorandum that around this time, discussions were taking place between Telenor and Esat Telecom and/or Communicorp Group Limited with a view to forming a business for the purpose of bidding for the second GSM licence in Ireland. This appears to be borne out by information supplied to the Tribunal by Mr. John Callaghan. Mr. Callaghan has informed the Tribunal that he was a director of Esat Telecom Communications, having joined the board in December 1994, and a director of Esat Digifone from June 1995. He has informed the Tribunal that insofar as he can remember, his first direct involvement in discussions with potential partners in the consortium to bid for the second GSM licence was in April 1995, when he travelled to Paris for a meeting with France Telecom. Prior to that time, Denis O’Brien had been in discussions with others – he believes originally with the German company Deutsche Telecom and then the US company, Bell South. Mr. Callaghan has informed the Tribunal that he does not know why the first of these did not proceed, but Mr. O’Brien told him of how he was frustrated by difficulty and delay in trying to come to an agreement with Bell South through the early months of 1995. Mr. Callaghan has also informed the Tribunal that Mr. O’Brien had concluded that they would not be suitable partners and had decided to approach France Telecom. Mr. O’ Callaghan has further informed the Tribunal that he, Denis O’Brien, Massimo Prelz, and Leslie Buckley met representatives of France Telecom in Paris on the 13 April, 1995. The meeting went well. France Telecom were opposed to a 50/50 ownership structure in the bidding and Mr. Callaghan and his colleagues put forward the idea that maybe 20% could be held by Irish institutional investors. Mr. Callaghan has informed the Tribunal that he rang Mr. Kyran McLaughlin of Davy Stockbrokers from the France Telecom offices, and he (Mr. McLaughlin) was of the view that this could be achieved in the right circumstances. Mr. Callaghan has informed the Tribunal that they left Paris pleased with the progress made. Mr. Callaghan cannot be sure exactly of what happened next leading to the involvement of Telenor, but that he understands that PA Consulting had been engaged to advise and assist in the preparation of the ESAT consortium’s tender for the GSM licence. They had particularly relevant experience and knowledge in the construction of such bids, and their view of who would make a good partner would have carried a good deal of weight. They took the view that France Telecom would not be a convincing bid partner, because although it was a big powerful company, it did not have an impressive track record in the new area of mobile telephony. They – that is, PA – believed that ESAT would be better with one of the Telecom companies in the Nordic countries, where the development of mobile telephony had been enormously successful. They suggested Telenor and made an introduction. Mr. Callaghan has informed the Tribunal that he believes this took place in the latter part of April 1995. He has informed the Tribunal that representatives from Telenor travelled to Dublin soon afterwards and met Denis O’Brien. As Mr. Callaghan understands it, matters moved very quickly, and a broad understanding was achieved within days. The idea discussed with France Telecom that 20 % ownership would be with Irish investing institutions became part of that understanding. On the 12 May 1995, the Department issued a supplementary memorandum for the information of prospective applicants for the licence to become the second operator of GSM mobile telephony within Ireland, and this contained a draft preliminary licence with guidelines for submissions, including tables to be completed. The memorandum was supplementary to an information memorandum which appears to have been issued by the Department sometime around the 28th April 1995. In that information memorandum, responses were furnished in accordance with the headings created by the Department in the summary of questions posed by prospective applicants in the information round. If I may return for a moment to the RFP document and paragraph 3 of that document. Mr. Fintan Towey has informed the Tribunal, and of course he was a member of the Project Group: “My understanding was that paragraph 3 of the RFP was designed to ensure clarity as to who the backers of the project would be”. Mr. Martin Brennan, who was Chairman of the Project Group, has informed the Tribunal: “In relation to paragraph 3, this must be read in the context of pages 24 and 25 of the memorandum responding to questions posed by applicants”. In other words, Mr. Brennan has informed the Tribunal, and Mr. Brennan alone, that paragraph 3 must be read in the context of the response to the question posed regarding the change of ownership, and that this relates to consent of the Minister being obtained in respect of any major change or substantial alteration of, not the applicant, but the operator of the second GSM licence. This is a matter which will, perhaps, assume significance when subsequent events are being considered. It should at this stage also be noted that the answer given in this document in response to the query concerning financial capability is taken from the draft handwritten document on the Department files to which I have already referred, which differs in some respects from the draft furnished by Andersens, the consultants engaged to assist the Department and who were assisting at that time in drafting responses in respect of the information round. The Tribunal does not yet know how this particular response to the question regarding financial capacity was arrived at or who arrived at it and included it in the response to be issued to applicants. Around this time, there were other events occurring which it seems appropriate to draw attention to. Mr. Denis O’Brien’s diary for the 17 May 1995 contains the following entries: 5:00pm: Enda Kenny. 7.30: Richard Bruton. The background to these entries appears to be this: A Mr. Dan Egan has informed the Tribunal that he had been involved over the years with the Fine Gael Party and has held a number of positions with the party, both voluntary and professional. He has informed the Tribunal that in 1978 he was appointed by the Party to head up Young Fine Gael and held that post until 1981. He was then appointed a party officer at Fine Gael headquarters in 1981/1982. Thereafter, he left to pursue his academic studies and academic interests. He has informed the Tribunal he was appointed special advisor to Mr. John Bruton in 1996, during the last six months of Mr. Bruton’s period in office as Minister for Finance. He has informed the Tribunal that his most recent appointment was as secretary to the Fine Gael delegation to the Forum for Peace and Reconciliation in 1995, and at that time he was based both in Dublin Castle and at Fine Gael headquarters. Mr. Egan has informed the Tribunal that he has never been involved in any aspect of Fine Gael fundraising. Apart from his political activities, Mr. Egan practices as a sole practitioner operating as a promotional consultant. In 1995, Mr. Egan has informed the Tribunal that he was approached by the late Mr. Jim Mitchell and asked if he would consider acting as an advisor/consultant to Mr. Denis O’Brien. Mr. Egan understands that Mr. O’Brien wished to raise his general profile, including his profile with the Fine Gael Party. Mr. Egan had an initial meeting with Mr. O’Brien to discuss what was required and to discuss the terms and conditions of his engagement. Having considered the matter, Mr. Egan agreed to assist Mr. O’Brien, and thereafter Mr. O’Brien and Mr. Egan had a small number of meetings. Mr. Egan advised Mr. O’Brien that he should attend a Fine Gael fundraising event, where he would have an opportunity of meeting Ministers in an informal setting. Mr. Egan has informed the Tribunal that he arranged meetings between Mr. O’Brien and Mr. Enda Kenny, then Minister for Tourism and Trade, and between Mr. O’Brien and Mr. Richard Bruton, then Minister for Enterprise and Employment. The purpose of these meetings, according to Mr. Egan, was to enable Mr. O’Brien to explain his interest in the second GSM licence and to outline his credentials to Ministers of commercial departments. Mr. Egan has informed the Tribunal that the meeting between Mr. O’Brien and Mr. Kenny took place at Government Buildings. Mr. Egan has also informed the Tribunal that while he escorted Mr. O’Brien to the meeting, he did not attend the meeting itself. Mr. Egan has informed the Tribunal that while he was in Government Buildings for the meeting with Minister Kenny, he happened to meet with Mr. Richard Bruton and asked Mr. Bruton there and then to meet with Mr. O’Brien. Mr. Richard Bruton, although somewhat reluctant, agreed to meet with Mr. O’Brien, and they met briefly. Mr. Egan has informed the Tribunal that he was not present at that meeting. Mr. Egan has informed the Tribunal that he recalls that he may also have discussed Esat Digifone with a Mr. Phil Hogan, TD, and that Mr. Hogan may have assisted Mr. Egan in arranging the meeting between Mr. O’Brien and Mr. Kenny. Mr. Phil Hogan has informed the Tribunal that he did not have any involvement in arranging any meeting between Mr. O’Brien and Mr. Kenny. Enda Kenny has informed the Tribunal that he has no recollection of a meeting with Mr. O’Brien. He has informed the Tribunal that his official diary for the period records an entry for Mr. Dan Egan for 5:00pm on the 17 May 1995. He has also informed the Tribunal that as a member of the Government, he was aware of the second GSM licence but that he had no involvement with it, as it was a project which was under the control of the Department of Transport, Energy and Communications and Minister Michael Lowry. Mr. Richard Bruton has informed the Tribunal that he has no recollection of any meeting with Mr. Denis O’Brien, but that his diary does have an entry for Denis O’Brien, 7.30, for the 17 May 1995. Mr. Bruton has informed the Tribunal that he was a member of the Cabinet committee set up by the Government on the 7th February 1995, and which met on the 16 February 1995, and which agreed to proceed with the proposed GSM tender competition as outlined in the Minister for Transport, Energy and Communications’ Aide-Memoire for the Cabinet committee. Apart from that, Mr. Bruton has informed the Tribunal that he had no involvement in the second GSM licence competition. Sorry, Sir, if you just bear with me for one moment, please. I intended at this stage referring to another document which may have some connection with these meetings, but it’s not clear at the moment whether it has been served on everybody, and I’ll come back to it. CHAIRMAN: The content of the next minute? MR. COUGHLAN: No, not that, Sir. On the 18 May, 1995, the seventh meeting of the GSM Project Group took place. At that meeting Andersen Management International presented their evaluation model. The minute of the meeting notes, “Prior to presentation of AMI’s” – that’s Andersen Management International’s – “evaluation model, its confidential nature was emphasised. It was agreed that three copies would be left in Dublin in the hands of Fintan Towey, Sean McMahon, and Jimmy McMeel. Lock and key security would apply at all times. AMI distributed copies of the draft model and, after initial studies, the group had no major difficulty with the chosen format, and a page-by-page scrutiny ensued. Then there is a page-by-page scrutiny. On the second page of the minute, under the heading “Paragraph 4”, there is a paragraph which reads that “The qualitative evaluation was to provide a common-sense check on the quantitative model. This part of the model would need to be clarified further, before evaluation begins. If a later challenge were to reveal that any two persons among the evaluators proceeded with a different understanding of the process, then the entire evaluation process could be put in question. – that Belgium now understood that they had the silent approval of the Commission since they had imposed the minimum fee on both the new and on the incumbent GSM operator. The reference in that minute to infrastructural freedom being a major example of asymmetrical regulation in favour of GSM II is a reference to an argument which could be and was eventually made to the Commission that competition would not be distorted and the requirements of the commission could be satisfied by a combination of an auction fee even in the absence of a compensating payment by the incumbent, where other compensating measures are adopted, such as the freedom for a GSM II operator to establish its own infrastructure; a freedom not always available to GSM II operators in other countries. The argument that was taking place at this time appears to be that if asymmetrical regulation in favour of GSM II was provided for, that that would be satisfactory to the Commission, and that the fee being charged to the new entrant would not be viewed by the Commission as being discriminatory in the absence of a compensating payment by, or similar fee being charged to, the incumbent. From information which has been made available to the Tribunal in recent times by the Commission, such an asymmetrical solution seems to have satisfied the Commission in relation to the case of Italy, where there had been an open auction and a substantial fee paid. Mr. Jimmy McMeel of the Department of Finance prepared a note for the file of the Department of Finance on this meeting dated 19 May, 1995. In the first portion of that note, he states that “Andersens (consultants) circulated their evaluation methodology document. (Consultants emphasised the secrecy of this document, which also deals with the weightings issue. Each member of the Project Group was given his/her own named copy which had to be returned at the end of the meeting. Department of Finance and DTEC allowed to retain one copy of each on the understanding it would be held under lock and key). “The evaluation document deals with quantitative and qualitative evaluations. The latter acts as a check on the former, and as such is at a higher level. The quantitative evaluation forms an annex to the evaluation report. The consultants’ experience has been that both the quantitative and qualitative evaluations tend to produce the same leading candidates. The qualitative process narrows it down. “Weightings for the quantitative evaluation criteria were discussed, but it was agreed, for reasons of confidentiality, no formal hard-copy record would be kept. The note continues below, under the heading “Letter from the EU Commission on the Application of a Licence Fee”, “DTEC are worried about the implications of the Commission’s position on the selection process. They feel it could weaken the State’s case in the event of a disappointed applicant taking an action. A disappointed applicant could claim that there would be a different result if the State had not imposed a fee contrary to EU policy. Consultants advise that DTEC should have a face-to-face meeting with the Commission as soon as possible. DTEC feel that the liberalisation of the infrastructure provision strengthens Ireland’s hand. They also believe that the imposition of a fee on Eircell could also avoid action by the Commission. In this context they raise the possibility of substituting a £10 million fee from Eircell for a dividend from Telecom Eireann for the 1994/95 year. Mr. Sean McMahon has informed the Tribunal that when the evaluation model was first proposed by AMI, it was discussed at a project team meeting. It was proposed that the various criteria would be qualified, insofar as they could be, and compared on as close a basis as possible. This would entail some mathematical treatment of the various data. He was generally impressed with the efficacy of the methodology, and he was satisfied that it would produce a true and fair ranking of the bids. This was to be the quantitative assessment. He felt confident that AMI would be competent to execute this aspect. Mr. McMahon has also informed the Tribunal that there was also to be a qualitative assessment, and he formed the impression then that this meant that insofar as the bids were not susceptible to close quantitative analysis, they were to review their results and qualify them as necessary in the light of the best qualitative information available to them. He felt then, and throughout the process that followed, that it would entail a close examination of all the judgemental aspects of the various bids, including the reputations and strengths of the various consortia, and their constituent members, and their technical, business and financial track records. Mr. Towey, another member of the Project Group, has informed the Tribunal that the quantitative and qualitative analyses were evaluation techniques proposed by Andersen Management International. The quantitative approach entailed the comparison of applications on the basis of a relatively small number of objectively quantifiable variables. There was no eliminative judgement required once the decision was made on what figures would be put into the model. The qualitative approach contained the comparison of applications on the basis of a wider range of indicators, including indicators which required some judgement to be made by the evaluators. The distinction, therefore, between the two techniques was in the nature and extent of the evaluation. The quantitative evaluation played no role in the ultimate decision. According to Mr. Towey, it would have been far too superficial as a basis on which to discriminate between applications. In any event, Mr. Towey’s recollection is that all the indicators included in the quantitative evaluation were also included in the qualitative evaluation. While the quantitative evaluation indicated that the application by A3 – I’ll not mention the name for the moment – had the highest score, and the oral presentation confirmed that this was a strong application, Mr. Towey has informed us that the quantitative valuation was clearly an inadequate basis on which to take a decision. The possibility of doing so did not occur to him, or to his knowledge to any other member of the project team. He does, at some point, remember posing the question to the consultants as to whether it was unusual in their experience that the qualitative and quantitative evaluation would produce different results. The response given was that it would be unusual for the different techniques to produce the same results. Mr. Towey has informed the Tribunal that all the project team were party to a consensus decision that the final result should be determined on the basis of the qualitative evaluation. It would appear from the minute of the meeting of the 7th GSM project group on the 18 May 1995, and the note to file made by Mr. McMeel on the 19 May 1995, and the information furnished to the Tribunal by Mr. Sean McMahon and Fintan Towey that there was at least confusion at that stage among members of the Project Group as to how the evaluation model was to be applied. As of now, the Tribunal has seen no correspondence, note of meeting, or been informed by any member of the Project Group as to how a consensus emerged in relation to the application of the evaluation model. I will be returning to the whole question of the evaluation model at a later stage in my opening, Sir. “On the 19th May 1995, Advent agreed to give Communicorp Group a loan of $5 million US, convertible after five years into 20 % of the radio division. This agreement was reached at a meeting in the ESAT boardroom attended by Bob Shenfield, yourself and myself. “On the following Saturday, 20th May 1995, the terms of the agreement were confirmed to John Callaghan when John and I spoke to you on the phone from his house. “Subsequent to this agreement, you attended a meeting with me at Woodchester Bank and confirmed to them that the loan was being made available. “On Tuesday, 30th May, 1995, you spoke to me in Norway and informed me that your board had not approved our agreement and that you were now offering a straight five-year loan with an annual coupon of 30 % and specific terms relating to early repayment. Communicorp never accepted this offer. “On the 15th June, John Callaghan, Peter O’Donoghue, yourself and myself met in our GSM office in Jenkinson House. We reached agreement on the terms of the bridging finance, and these were documented by John Callaghan, an independent director, a copy of which are attached. “Can you please confirm to me whether Advent are going to adhere to the agreement reached on bridging finance at our meeting on the 15th June? If Advent are not going to do so, I need to inform the directors at the board meeting scheduled for tomorrow. In addition, we would also need to hold a board meeting of Communicorp Group Limited immediately to discuss the financing needs of the group. “The outstanding issues in relation to the ESAT/GSM agreement can be resolved later. In the summer of 1995, Denis O’Brien’s companies were stretched for cash. He turned to Massimo Prelz of Advent, a venture capital company, that had already provided significant support to his companies. In May 1995 they negotiated on the basis of a $5 million convertible loan, but the Advent board did not give its approval. Mr. Callaghan has informed the Tribunal that he attended a meeting on the 15 June 1995 at which agreement was reached on the a bridging facility for Communicorp which was a one-year facility of £3.2 million with a 30% redemption premium. Denis O’Brien insisted on similar terms for amounts due to him of £600,000. Mr. Callaghan has also informed the Tribunal that at the same time as this facility was being put in place, an agreement was under negotiation whereby Advent (or funds it represented) would secure the right to take up 5 percent of the equity in Esat Digifone if the ESAT consortium succeeded in getting the GSM licence. In return, Advent would give a comfort letter supporting ESAT’s ability to meet its financial commitments to Telenor and for the GSM tender. – Advent to give letter to satisfy Telenor and requirements of GSM bid. (Strong letter but cannot be a “commitment” to invest). On the 29 May, there was a golf classic for the Meath constituency of Fine Gael. Fine Gael have informed the Tribunal that Denis O’Brien/ESAT subscribed £400 on the 30 May 1995, the Department received a memorandum from Andersen Management International concerning the GSM II tender in Ireland and the approach of the Commission. The memorandum considered the main issues raised by the Commission in their letter of the 28 April 1995 and proposed two ways to proceed. The advice from Andersens was: “One is to request an equal payment from Telecom Eireann, for example, according to paragraph 4 of the RFP document. In practice this would mean that Telecom Eireann pays £5 million. If this is not enough for the Commission, it could be communicated to the applicants that they will not be requested to pay more than the minimum payment. That is £5 million. “Ultimately, equal payments could also mean no payments. Saved payments should then be regarded as a windfall gain to be used to achieve lower tariffs ‘pence-by-pence’. “Another is to introduce asymmetrical regulation in favour of the GSM II licencee. The basic philosophy behind asymmetrical regulation in this case would be to acknowledge that the competition between the two GSM operators is unequal from the outset, and in order to obtain equality, unequal operators should be regulated unequally. In practice, this would mean to give the GSM II operator some advantages; for example, cheap access to national roaming on the GSM I network, a more favourable interconnect regime during the first couple of years, immediate access to DCS 1800, or lower payments initially for the use of the frequency capacity needed. The already adopted early liberalisation of infrastructure for GSM II and the potential for national roaming on the GSM I network are significant instances of such asymmetric regulation. Continuing: “These two solutions are not mutually exclusive but could somehow be combined. “It is not recommendable to move ahead with such solutions before the Commission has had a chance to elaborate on the issues raised. Therefore, it is suggested to welcome the invitation to a technical meeting. Even before that, it might also be considered to take informal contact with Mr. Herbert Ungerer and Mr. Hocepied, who are the civil servants in charge of these matters in DG IV of Karel van Miert. “Attention has also to be paid to the fact that it seems unlikely that the Commission would try to stop the Irish GSM II tender or open an infringement procedure at this stage. Thus it seems as if it is in the Irish interest to come to a common understanding with the Commission before the evaluation commences; alternatively, to postpone the expire date. “If Ireland does not come to a common understanding with the Commission before the evaluation commence/licence award, Ireland might later be forced by the Commission to refund the licence fee to the GSM II licencee, which might be the outcome of the Italian case. If this turns out to be the case in Ireland, also the possible risk that unsuccessful applicants could then successfully challenge the selection has to be faced. The risk is considered to be very high, since the unsuccessful might have spent in the order of £10 million or more to submit the application; thus the cost of litigation will be considered small compared to the possible fact that changed selection criteria are introduced ex post, which can easily be proved when the fourth criteria in paragraph 19 of the RFP document (‘the amount the applicant is prepared to pay for the right to the licence’) is removed. “Even if the Minister and his Department declare that such a change had no influence on the outcome of the selection, the unsuccessful applicant would still be in a good position to successfully claim that they would have composed the business case/application in quite a different way if they had known that such an ‘extremely important criterion’ were to be disregarded”. On the 31 May, 1995, the Department of Transport, Energy and Communications consulted the office of the Attorney General regarding European Union aspects to the competition for a GSM licence in Ireland and furnished an Aide-Memoire. Fine Gael have informed the Tribunal that in late May, 1995, a fundraising lunch took place in the Glenview Hotel for the Wicklow by-election. Fine Gael have informed the Tribunal that Denis O’Brien attended the event and that he or ESAT donated £5,000. Mr. Michael Lowry informed the Tribunal that he was present at this particular event. Fine Gael have informed the Tribunal that in June of 1995, a Dublin West constituency lunch took place ,and it was attended by Mr. Denis O’Brien, and that Mr. Denis O’Brien or ESAT subscribed £1,000. Now, I have made previous reference to the preparation of a memorandum by Mr. Tom Byrne of Davys and Mr. Paul Connolly, associated with ESAT, to be presented to interested parties seeking institutional support, and that memorandum estimated that the financial fee payable would be in the region of £20 million. As a result of the involvement of Davys and on foot of this memorandum prepared by Mr. Byrne of Davys and Mr. Paul Connolly, AIB Capital Markets, IBI Investment and Standard Life furnished letters of interest. The total amount of these three institutional investors indicated that they were prepared to invest amounted to £8.5 million. CHAIRMAN: Well, Mr. Coughlan, I think you are moving on to a relatively elaborate meeting in Brussels. And as I am conscious that there are Tribunal meetings fixed for later in the afternoon, and indeed into the late evening, I think it’s probably an appropriate time to finish today’s public sitting. What time do you want me to say in the morning? MR. COUGHLAN: Could I just, before you do rise, could I just say that I made reference to a fundraising lunch in the Carlow/Kilkenny constituency to which Mr. Denis O’Brien or ESAT made a contribution. Mr. Lowry has informed the Tribunal that he was present at that particular event. CHAIRMAN: I see. Very good. MR. COUGHLAN: We’ll say eleven o’clock, Sir. CHAIRMAN: Eleven o’clock, in the context of other commitments. Thank you. THE TRIBUNAL THEN ADJOURNED UNTIL THE FOLLOWING DAY, WEDNESDAY, 4TH DECEMBER 2002, AT 11AM.